The drive to reduce costs, increase speed to market, and meet regulatory requirements has led many pharmaceutical companies to look at single-use, pre-sterilized, plastic equipment systems as an alternative to stainless steel lines. 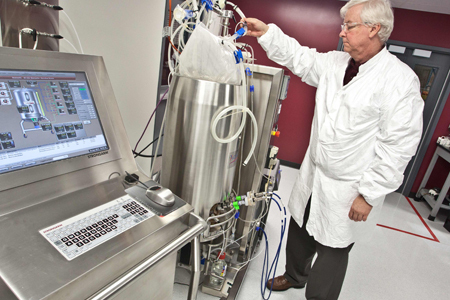 Single-use equipment makes the biomanufacturing process increasingly efficient and less costly. Single-use equipment can be used and then disposed of, eliminating the capital investments and development time to validate the cleaning and sterilization processes. Reducing time to market by removing process validation steps and eliminating the downtime needed to conduct these process steps between batches are key to increasing productivity. Years ago the FDA first allowed biotech manufacturers to switch from producing biological products in dedicated facilities to producing multiple products in the same facility under the condition the equipment was sufficiently cleaned. This led manufacturers to look at single-use technology versus installing costly, clean-in-place and sterilize-in-place systems. With no standard definition of “clean,” it is difficult to prove equipment is cleaned adequately. Switching to single-use equipment eliminates this question. Today, the biggest driver leading pharmaceutical companies to consider single-use is cost reduction. With current technologies, pharmaceutical companies can build manufacturing capacity in less time and at lower cost than with traditional stainless steel equipment and infrastructure. Single-use manufacturing technologies can reduce these capital expenditure costs as well as water and energy usage. These savings in both time and money allow pharmaceutical companies to build capacity at a later stage in the clinical cycle when they are more certain their product will reach the market. And, the reduction in downtime for sanitation increases facility utilization, translating into producing more product in the same facility. Switching to single-use may increase capacity enough to eliminate the need to buy or build another facility. There has also been interest in single-use for niche applications. In manufacturing cytotoxic agents there is a risk of operator exposure during manual cleaning, so companies look to single-use as a means of disposing of contaminated equipment while minimizing operator exposure. Another driver has been the sensitivity of some protein-based drugs to metal ions, leading manufacturers to look for alternatives to metal equipment. Technology has developed to enable the connection of two sterile systems to create a continuous sterile flow path, and single-use systems can be supplied pre-sterilized by gamma radiation. In addition, the FDA’s recognition that eliminating manual aseptic connections in Class A environments provides higher sterility assurance became another driver. While initially sought as a sanitation solution, single-use equipment can also improve flexibility. During process design, single-use equipment makes it easier, faster, and cheaper to change system configurations for subsequent trials. Manufacturers can adjust the size, length, and number of tubes when ordering the next batch of single-use equipment. In contrast, with stainless steel systems, the lead time for adjustments is much longer and costs much higher. For established processes, because single-use systems can be set up, used, and discarded, it is easier to change processes in a multi-product facility, making the facility itself more flexible. (With stainless steel, all drugs need to use the same equipment.) Another benefit is the modularity. If you want to double your capacity or build a similar facility elsewhere, it’s easier to implement a single-use system than to build a stainless steel plant. Additionally, single-use systems use significantly less water than stainless steel systems. The bulk of the water used in a pharmaceutical facility is for cleaning, which limits the ability to put pharmaceutical plants in certain places. The reduction in the water required makes factory location more flexible. This is also a sustainability advantage. Even with all the benefits, there are still challenges to implementing single-use systems. Currently, the biggest issue is to qualify the safety of extractables and process-derived leachables from fluid-contact plastics. Analytical methods have been well established, but GMP regulations require a demonstration of safety. The FDA does not prescribe the extent of studies and allowable limits for extractable or leachable compounds, challenging suppliers and users with anticipating what and how much data is expected by regulatory authorities. Recently, several industry organizations have published standardized consensus recommendations, and the U.S. Pharmacopeia (USP) is developing a standard for extractable testing of plastic process equipment. However, since regulatory authorities consider safety and quality aspects of extractables and leachables on a product-specific basis, there will always be some judgement required from both users and regulators, and extractables and leachables testing requirements and limits will never be fully standardized for all drug products. When looking for a single-use solution, there are several critical issues to considered. It is important to ensure that the suppliers’ manufacturing processes are validated. Be sure suppliers have sufficient data to demonstrate the reliability and safety of their products, and that they have adequate quality systems in place. Another consideration is good data on the consistent supply of raw materials. A comprehensive change management and change notification system needs to be in place to ensure minimal change along with clear and timely change notifications when necessary. There is concern from users whenever a supplier makes changes to the raw materials that may affect the extractables and leachables profile. Look into security, continuity, and adequacy of supply. Qualifying must go further than just documentation. It’s important to audit all suppliers on a reasonable basis. This year’s Healthcare Packaging EXPO, co-located with PACK EXPO (October 14 to 17 at McCormick Place in Chicago) will provide attendees the opportunity to see the latest innovations around single-use systems as well as new technologies in healthcare packaging. Produced by PMMI, The Association for Packaging and Processing Technologies, the show will feature free educational sessions on the Innovation Stage focused on regulatory issues and cutting-edge solutions pertaining to healthcare, pharmaceutical, and biopharmaceutical businesses. Together, the shows will feature 2,500 exhibitors and draw 50,000 attendees. For more information and to register, visit hcpechicago.com.